Orbital ATK’s proposed rocket to answer the U.S. Air Force’s desire for two families of satellite launchers with U.S.-made propulsion systems will be named OmegA, and the company has selected the cryogenic Aerojet Rocketdyne RL10 engine to power the vehicle’s upper stage, officials announced this week. The OmegA rocket could launch for the first time in 2021, but Orbital ATK is competing against several aerospace companies for a pot of Air Force funding the military is expected to award this summer. Blue Origin, SpaceX and United Launch Alliance are expected to compete for the government support, and then Air Force says it will make up to three funding awards. Orbital ATK previously disclosed that two solid-fueled rocket motors will power the first and second stages of the OmegA launcher. Company officials considered hydrogen-fueled engine proposals from Blue Origin and Ariane Group before settling on Aerojet Rocketdyne’s RL10 engine for OmegA’s upper stage. Artist’s illustrations of the OmegA rocket show two RL10 engines on the OmegA’s third stage. The new engine derivative selected to fly on the OmegA rocket is known as the RL10C-5-1, a modified version of the RL10C-1 engine currently flying on United Launch Alliance’s Atlas 5 rocket. Aerojet Rocketdyne said the new version of the RL10 engine will feature a 3D-printed injector assembly. Variants of the RL10 engine have flown in space nearly 500 times since the 1960s. Orbital ATK officials said the OmegA rocket’s development has advanced over the past three years with a more than $250 million joint investment with the Air Force. The company ranks the launcher project — the most powerful rocket yet developed by the commercial space firm — as one of its top strategic programs, and Orbital ATK said in a press release it has committed an “even larger” investment to complete OmegA development and certification. Orbital ATK said it named the rocket for the Omega Centauri star cluster, with the capitalized “O” and “A” representing the company’s name. Orbital ATK’s other launchers, like the Pegasus, Taurus and Antares, are named for constellations and stars. The OmegA rocket, previously known as the Next Generation Launch system, will use segmented solid rocket motors based on the boosters Orbital ATK built for the space shuttle. But engineers developed a new composite case to replace the metallic structures used for the shuttle, making the OmegA solid motors lighter and easier to manufacture, according to Mike Laidley, Orbital ATK’s vice president for the OmegA program. The OmegA rocket will come in two basic versions: an intermediate and a heavy configuration. The intermediate version would have a two-segment solid-fueled core stage, called a Castor 600, that would generate 2.1 million pounds of thrust at liftoff. The heavy version would have a four-segment core rocket motor, the Castor 1200, putting out 3.1 million pounds of thrust. Both configurations would have a single-segment Castor 300 second stage motor, built using the same tooling as the multi-segment first stage motors at Orbital ATK’s facility in Promontory, Utah. Up to six strap-on solid rocket boosters could be added to the OmegA rocket to lift heavier payloads into space. The intermediate version of the OmegA rocket could launch for the first time in 2021 from pad 39B at NASA’s Kennedy Space Center in Florida. The heavy configuration is expected to fly in 2024. 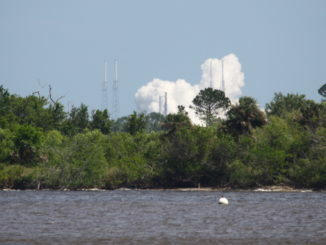 Orbital ATK is assessing a location for a West Coast launch site for polar orbit missions, with Space Launch Complex-2 and Space Launch Complex-6 — the current homes of ULA’s Delta 2 and Delta 4 rockets — emerging as the primary options, Laidley said. 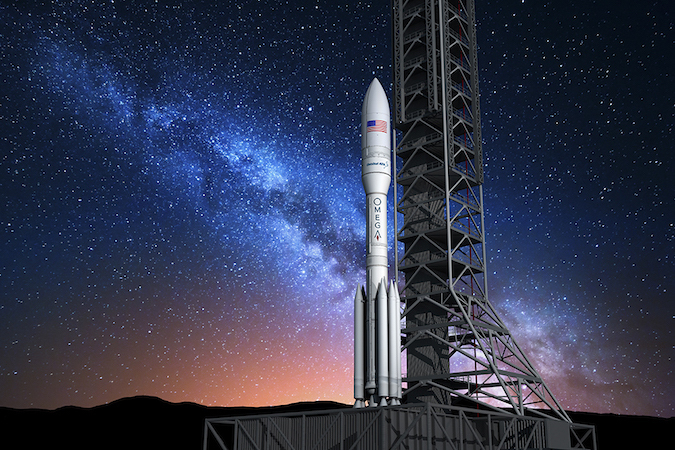 The OmegA rocket will be fully expendable, and the company aims to reduce costs through simpler manufacturing processes and shared costs with other Orbital ATK programs. Officials have not disclosed how much each OmegA flight will cost. Orbital ATK plans to build the launcher’s 5-meter (16-foot) diameter payload shroud — roughly the same diameter as fairings flown on Atlas 5, Falcon 9 and Ariane 5 rockets — at the company’s structures division in Iuka, Mississippi. The OmegA’s exact performance capability depends on the number of solid-fueled boosters added to the rocket. “Right now, we’re planning on about three to four missions per year to close our business case,” Laidley said in a recent interview with Spaceflight Now. “A couple of those could come from the Air Force and a couple of those could come from either our internal needs or the commercial community. 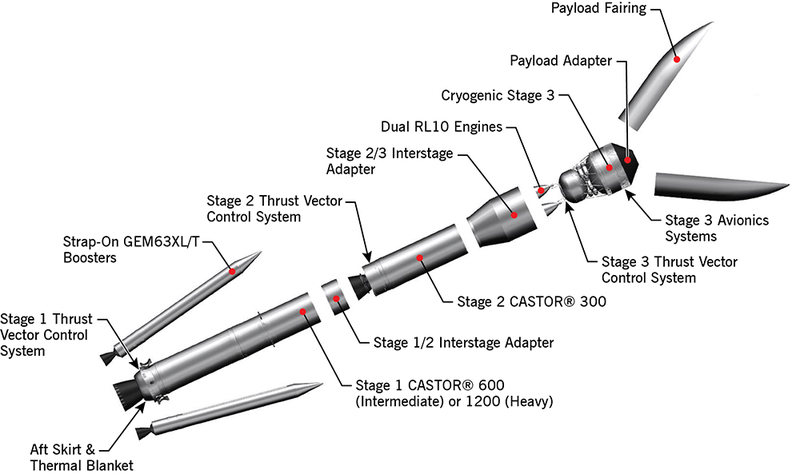 A previous round of Air Force funding awarded to Orbital ATK — along with ULA, SpaceX and Aerojet Rocketdyne — was limited to development of the Common Booster Segment, the name for each segment the OmegA’s core solid-fueled Castor 1200, 600 and 300 rocket motors. Early design work on the rest of the rocket was funded by Orbital ATK’s internal coffers. If Orbital ATK wins a further tranche of Air Force funding this summer, the money will complete the development of the launcher’s solid-fueled core stage and prepare for a ground test-firing of the motor next year. Orbital ATK said engineers have built four composite cases for ground testing of the OmegA’s core motor, and technicians will begin pouring an inert propellant mixture into one of the test casings for the first time next week. 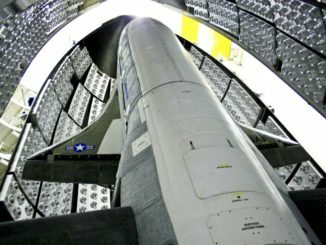 The Air Force plans to down-select to two launch providers in late 2019, giving the military two contractors capable of delivering all the U.S. government’s defense-related payloads to orbit. ULA and SpaceX currently provide launch services for the government’s most critical national security payloads, but ULA’s Atlas 5 rocket uses a Russian-made main engine, and ULA admits its Delta 4 rocket is too expensive to be competitive. 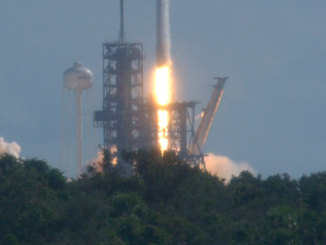 SpaceX’s Falcon 9 rocket is less expensive and uses U.S.-made engines, but the company’s bigger Falcon Heavy rocket is not yet certified by the Air Force for national security missions. The Falcon Heavy could be certified as soon as next year after further successful flights, which will make it eligible to compete for Air Force EELV-class contracts following a flawless maiden test launch Feb. 6.